Difference between revisions of "Wanda Firebaugh"
In the aftermath of the battle, on Parson's orders, Wanda Decrypted many newly-croaked units while in the [[Magic Kingdom]] (as the croaked bodies were able to pass through the portal), thus giving Gobwin Knob an unprecedented military presence there. She later returned to Spacerock along with Parson and the rest of Gobwin Knob's casters. But despite the signing of a treaty of nonaggression between [[Gobwin Knob]] and [[Charlescomm]], a conflict between the two sides soon began when [[Charlie]] acquired a [[decrypted]] [[archon]] [[prisoner]] named [[Lilith]], who had been captured in combat by [[Jetstone]] during the Battle of Spacerock. Charlie had Lilith brought to [[Charlescomm (city)]] because he hoped to learn how [[decryption]] by the [[Arkenhammer]] had destroyed her former love and loyalty towards him. Wanda intervened to stop Charlie from retaking control of Lilith's mind by [[link]]ing with Gobwin Knob's [[thinkamancer]] [[Maggie]], and remotely [[repatriating]] Lilith. This freed Lilith within Charlescomm's defenses, which eventually allowed her to croak two of Charlie's high ranking archons, acquire some [[gun]]s, (the design of which had previously been a secret known only to Charlescomm and [[Clad Gauntlet]]) and badly damage the city of Charlescomm itself, before escaping into the [[Magic Kingdom]]. If Wanda hadn't mistakenly believed that[[Fate]] required [[Parson]] to personally croak Charlie, Lilith would probably have ended the war by croaking Charlie herself, but instead Wanda allowed Charlie to escape Lilith, a diversion from the most direct path to Wanda's Fate which led directly to a battle between Gobwin Knob and Charlescomm in the [[Magic Kingdom]], and Wanda's own capture by [[barbarian]] [[castrer]]s.
But despite the signing of a treaty of nonaggression between [[Gobwin Knob]] and [[Charlescomm]], a conflict between the two sides soon began when [[Charlie]] acquired a [[decrypted]] [[archon]] [[prisoner]] named [[Lilith]], who had been captured in combat by [[Jetstone]] during the Battle of Spacerock. Charlie had Lilith brought to [[Charlescomm (city)]] because he hoped to learn how [[decryption]] by the [[Arkenhammer]] had destroyed her former love and loyalty towards him. Wanda intervened to stop Charlie from retaking control of Lilith's mind by [[link]]ing with Gobwin Knob's [[thinkamancer]] [[Maggie]], and remotely [[repatriate|repatriating]] Lilith. This freed Lilith within Charlescomm's defenses, which eventually allowed her to croak two of Charlie's high ranking archons, acquire some [[gun]]s, (the design of which had previously been a secret known only to Charlescomm and [[Claud Gauntlet]]) and badly damage the city of Charlescomm itself, before escaping into the [[Magic Kingdom]]. If Wanda hadn't mistakenly believed that [[Fate]] required [[Parson]] to personally croak Charlie, Lilith would probably have ended the war by croaking Charlie herself, but instead Wanda allowed Charlie to escape Lilith, a diversion from the most direct path to Wanda's Fate which led directly to a battle between Gobwin Knob and Charlescomm in the [[Magic Kingdom]], and Wanda's own capture by [[barbarian]] [[caster]]s.
"Wanda" redirects here. For the fish, see Wanda (fish). For choice and memorable utterances, see Quotes: Wanda Firebaugh. "I did not say it was a stupid idea, Lord. But the strategic advantage of equipping infantry with scary hand puppets is lost on me." Lady Wanda Firebaugh is a Croakamancer currently lurking beneath the bedrock in the Magic Kingdom. She was until recently prisoner of barbarian casters. Before that, she was Chief Croakamancer of Gobwin Knob, in the service of Lord Stanley. Before entering Stanley's service, she was popped by the side of Goodminton. Her father was Overlord Firebaugh who promoted Wanda to Heir Designate moments before the destruction of Goodminton. After that, Wanda worked first for Haffaton, and then later for the Kingdom of Faq. Wanda is an unusually versatile caster, as a Master-class Croakamancer, plus at least Novice in Dirtamancy, Dollamancy, Findamancy, Shockamancy, Thinkamancy, probably Turnamancy, and possibly other disciplines, but she claims to dislike casting spells other than Croakamancy. She cast the spell that summoned Parson. She has a talent and a taste for interrogation and is capable at it to the point she can break a Royal's will. Wanda's ability to gain Jillian's cooperation through torture suggests that Wanda has some talent for Turnamancy, since Jillian thinks Wanda's technique for turning a prisoner is superior to Vanna's. In the past, she used Dirtamancy to create memorial stones in honor of the croaked and once used Findamancy to recover the Arkenshoes from Olive Branch on her ruler's behalf. Wanda sees herself (and Stanley) as "minor actors" serving a greater destiny. She believes she and the other individuals who are attuned to Arkentools have a role to play in the Titan's plans, and that no one (not even herself) can prevent this plan from happening. She does think that by supporting the Titan's plan, and not opposing it, she can reduce the amount of pain and suffering experienced by everyone involved. Wanda is of average height for a human female from Erfworld. She has raven black hair that reach to her shoulder blades (but is frequently worn up) and white skin. Her eyes are light blue with a white sclera, but no pupil, and the eyebrows are trimmed thin. Like all Erfworld humans, she has a somewhat childlike lower body with slender hips, adequate cleavage, and an overly large head (though this might just be due to artist drawing style). She dresses only in white, red, and black, and usually has some skull motif somewhere in her clothing or accessories. Wanda never stops wishing to perish, but this is a source of power in her case, being a form of croakamancy. Wanda is almost as old as Isaac Cipher, who is 21, 500 turns old. Before Wanda popped, her Fate Debt "rose as a column, into the millions and billions and more",IPTSF Text 1 which presumably made her the most heavily fated unit in existence. While exactly what this means is as yet unrevealed, it is explicitly stated in this text that someone must repay this debt. It is also stated that it's possible for people to return from death, if someone can pay the exact price of their debt. This implies that when Wanda decrypts a person, she is assuming their debt. Wanda is absolutely convinced that the predictions Marie Lavraie told her about the future of Erfworld are fated to come true. She knew that she would one day attune to an Arkentool, but did not know how this would come about. She also thinks that it is the Fate of the Arkentools to be found and brought together. As a consequence, whenever she has to make a decision, she takes the path which seems to lead most directly towards the fulfillment of these Predictions even if it seems horribly risky. Hence she conspired to bring Stanley to Faq, because she assumed he would die in the battle, allowing her to take the Arkenhammer. When that plan resulted in the destruction of Faq, she encouraged Stanley to adopt the high risk strategy of questing for other Arkentools, hoping that he might find one she could attune to. The quest for Arkentools nearly led to the destruction of Gobwin Knob, so she persuaded Stanley to buy an untested, potentially dangerous, and highly expensive spell which might bring a "Perfect Warlord" to Erfworld. This spell ultimately did lead to Wanda attuning to the Arkenpliers, which reinforced Wanda's conviction that Marie Lavraie's Predictions had been true, and that her method of trying to push history in the "correct" direction does produce results. After she had obtained the Arkenpliers, Wanda made some comments to Parson which indicate that she thinks she knows some things about his future as well. When Gobwin Knob's campaign to conquer Jetstone began, Wanda continued making very dangerous choices, such as her decision to deviate from the battle plans proposed by both Ansom and Parson, and her decision to personally lead the attack on Spacerock. Given Wanda's past history, this apparent recklessness may have been an attempt to fulfill another of Marie's Predictions, although Jack Snipe suggested it might have something to do with Queen Jillian. After Wanda gained the Arkenpliers, she believed she'd found the most direct pathway to the achievement of her Fate. However, the sudden shift in her fortunes after she turned down Jillian's offer of an alliance has persuaded her that she has somehow deviated from the correct path, though she doesn't yet understand precisely how. At the time, Wanda did not know that Marie Lavraie would later predict that Wanda would at some point rejoin the side of Faq, so she didn't realize that by turning down an alliance with Jillian, she was choosing the Hard Way. She continued to serve Stanley after she gained an Arkentool, and considered joining Charlescomm when Charlie's Archons confronted her underneath the Magic Kingdom's bedrock, because she believes it is the destiny of the Arkentools to come together. Exactly how rejoining her former side might affect her quest to unite the Arkentools is not yet clear. One of Wanda's listed strengths is Fashion, so it's not surprising that she changes her raiment much more frequently than any other character. 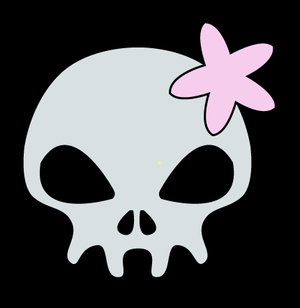 Wanda's livery is a grey skull with a pink flower on a black field. The flower is not dissimilar to the heroine buds Dame Olive Branch used to subdue her. However, pink flowers were initially a sign of Olive's apparelIPTSF Text 13. At one point early in her life, Wanda left one of those on a whim while refitting a suit for herself; she didn't know at a time that it was a piece of Olive's raimentIPTSF Text 7. Wanda has talent in many fields of magic, but little interest in any but Croakamancy. During the time she served Haffaton, whenever the side lost a caster, Wanda had to pick up their duty. Suggestion/mind control (scroll) TBFGK 30 - thinkamancy. Maybe this is when Wanda had cast the spell to control Jillian TBFGK 40 / TBFGK 41. When considering the many tragedies and losses which Wanda and the four sides she has so far belonged to have suffered, it is important to remember that when Wanda popped, she already owed Fate an enormous debt that someone would have to repay. It seems likely that all of the destruction caused both directly and indirectly by Wanda's actions has reduced the size of Wanda's debt. But she may yet still have a very long way to go, especially since decrypting people probably adds to her debt. Wanda was popped as the third caster for Goodminton. Lord Firebaugh had been falsely led to believe by Goodminton's Chief Predictamancer, Delphie Temple, that Wanda would pop as a Warlord. He was initially disgusted by her school of magic and wary of magic as a whole, but came to be more open-minded as Wanda showed her incredible value. At the time she popped, Goodminton was in a desperate situation fighting a losing battle against multiple sides at once. With the obvious tactical applications of her magic, and her open-minded curiosity, Wanda began to turn the tide of the war to her side's benefit. Wanda met Marie Lavraie and Jack Snipe in the Magic Kingdom shortly after her success during the Air Conflict over Goodminton city, when she was level 4 (presumably). Delphie told Wanda of several Predictions concerning her, which Wanda did her best to defy. Delphie Predicted that Olive Branch would become Wanda's Chief Caster, and that her Fate was entwined with Olive's. Wanda's unsuccessful attempts to avoid her Fate resulted in the destruction of Goodminton, which helped persuade Wanda that attempting to defy Fate is ultimately both futile and painful. After Goodminton's destruction, Wanda was forced to join Haffaton. Wanda served Haffaton for many turns, during which Wanda was "what she was needed to be"IPTSF Text 54. At some point she became subdued by Dame Olive using the heroine buds. This caused her to have an emaciated appearance that worsened over time. There were a number of Haffaton casters that worked together for various purposes, and Wanda was involved with many of these projects. The Thinkamancer Maxwell the Smart frequently linked Wanda to other casters, and this significantly increased Wanda's ability to perform magics other than Croakamancy. Hvs.tCF 279 For example, there were mannequins created by the Dollanamcer and Thinkamancer that she could operateIPTSF Text 56, a glass Turnamancy box for turning prisoners, etc. That box was operated by Wanda when Haffaton captured Jillian Zamussels of FaqIPTSF Text 39. This took place at a Stone garden that Wanda created near the City of Haffaton. It held Memorial stones with the memories of deceased units, and she was eager to gather stories of units so that she could "plant" them there. After Jillian's escape, Dame Olive became more annoyed with Wanda. Eventually, after recapturing the fugitive, she left Wanda in the Olive Garden together with Jillian, placing a hoop of twisted rose stems on her that worsened her heroine bud condition. However, meeting Warlady Jillian was predicted for Wanda by Maya, Haffaton's PredictamancerIPTSF Text 54. Jillian's presence in Olive Garden lead to the series of events involving King Banhammer of the Kingdom of Faq which ended with Overlady Judy Gale allowing Wanda to Turn to Faq. Judy then used the Arkenshoes to leave Erfworld, which left the heir, Olive Branch, as the new Ruler of Haffaton. Wanda then served as prosecutor in the trial of Olive Branch before King Banhammer and the Court of Faq. At this point, Wanda's heroine bud condition was at its worst and she was close to croakingIPTSF Text 78. She was saved when Jillian figured out that Charlie had a means to cure this condition, and subsequently required curing Wanda to be part of Jillian's Deal of a Lifetime contract. The procedure was performed via Charlie linking up with Betsy Murgatroyd, Faq's Healomancer, and took place in the Wizard’s Hall. Wanda recovered and continued to be Faq's Croakamancer. Following Stanley the Plaid's discovery of the Arkenhammer, Wanda attempted to acquire the Arkenhammer by arranging for Stanley to attack Faq. She claims she expected Stanley to be croaked, but her plan failed when Stanley unexpectedly acquired an unstoppable force of Dwagons while traveling from Gobwin Knob to Faq. She then turned to Gobwin Knob, and encouraged Stanley to seek the other Arkentools. TBFGK 147 Since the fall of Faq. Wanda has behaved in a way that suggests she is loyal to Stanley. She obeys his commands and serves his side without being under any loyalty spells. However, this may have been only to preserve his power as a tool to aid her in getting an Arkentool to attune to, and afterwards, to bring the remaining Arkentools together. During the events described in Book One, Wanda supplemented Gobwin Knob's rather meager forces by using Croakamancy to animate fallen troops as uncroaked. In particular, after the death of Lord Manpower the Temporary all of Stanley's remaining warlords were uncroaked. Wanda served as Stanley's chief adviser, being both highly intelligent and adept at persuading him to adopt her suggestions and think they were his idea all along. Most notably, she persuaded Stanley to spend the bulk of the treasury on a spell to summon a "Perfect Warlord" with the military genius to salvage Gobwin Knob's untenable situation, the casting of which summoned Parson Gotti to Erfworld. Wanda contributions to Stanley's war effort during this period included the practice of her "hobbies" -- torture and interrogation. After Jillian Zamussels was captured and brought to Gobwin Knob, she was subjected to torture and a magic spell (presumably some sort of Thinkamancy) and persuaded to reveal Prince Ansom's battle plans. (There is also a heavily implied sadomasochistic relationship between Wanda and Jillian, which indicates Jillian may not have been totally unwilling.) Wanda also demonstrated that she was capable of handling a wide variety of other Magic, but professed to lack real interest in any besides Croakamancy. Wanda has recently come into ownership of the Arkenpliers and was able to attune to them. According to her, it was Predicted in Faq "long ago" that this would come to pass, and that she has "wrecked and ruined" more than Parson (who, for perspective, had at the time of this comment just recently brought about the destruction of the entire Royal Coalition present at or near Gobwin Knob as well as all but a few soldiers on his own side) to ensure this would come to pass. Wanda was able to utilize the Arkenpliers to acquire control of a large army in a single turn because she had the remarkable good fortune to attune to the Arkenpliers immediately after an army of thousands were croaked and before the bodies vanished. The fact that she acquired an Arkentool at the exact time and place where her new tool could provide her with vast power suggests that her belief that she was Fated to gain an Arkentool is correct. After acquiring the Arkenpliers, Wanda and her Decrypted Chief Warlord Ansom led a campaign against Unaroyal in the name of Lord Stanley. The campaign resulted in the complete destruction of the Unaroyal side, and Wanda was able to Decrypt many of its fallen units to further boost Gobwin Knob's now-large army. Next, Wanda and Ansom attacked Spacerock, the capital city of Jetstone. During the battle, Ansom was captured by Jillian, and Parson Gotti was chosen as a replacement Chief Warlord. Parson's battle strategy made tactical use of Wanda's Decryption power to ultimately win the battle and conquer Spacerock for Gobwin Knob. In the aftermath of the battle, on Parson's orders, Wanda Decrypted many newly-croaked units while in the Magic Kingdom (as the croaked bodies were able to pass through the portal), thus giving Gobwin Knob an unprecedented military presence there. She later returned to Spacerock along with Parson and the rest of Gobwin Knob's casters. But despite the signing of a treaty of nonaggression between Gobwin Knob and Charlescomm, a conflict between the two sides soon began when Charlie acquired a decrypted archon prisoner named Lilith, who had been captured in combat by Jetstone during the Battle of Spacerock. Charlie had Lilith brought to Charlescomm (city) because he hoped to learn how decryption by the Arkenhammer had destroyed her former love and loyalty towards him. Wanda intervened to stop Charlie from retaking control of Lilith's mind by linking with Gobwin Knob's thinkamancer Maggie, and remotely repatriating Lilith. This freed Lilith within Charlescomm's defenses, which eventually allowed her to croak two of Charlie's high ranking archons, acquire some guns, (the design of which had previously been a secret known only to Charlescomm and Claud Gauntlet) and badly damage the city of Charlescomm itself, before escaping into the Magic Kingdom. If Wanda hadn't mistakenly believed that Fate required Parson to personally croak Charlie, Lilith would probably have ended the war by croaking Charlie herself, but instead Wanda allowed Charlie to escape Lilith, a diversion from the most direct path to Wanda's Fate which led directly to a battle between Gobwin Knob and Charlescomm in the Magic Kingdom, and Wanda's own capture by barbarian casters. Wanda and Marie both served King Banhammer as Casters in Faq. Marie has profoundly affected Wanda, first by Predicting that she would someday acquire an Arkentool, and later by arranging for Wanda, and Gobwin Knob, to be the recipient of the Perfect Warlord spell which summoned Parson. Marie chose to give the spell to Wanda, despite the objections of Janis, who strongly disapproves of Wanda. The fact that she survived the fall of Faq suggests that Marie may have known of Wanda's plan to lure Stanley to Faq, either because Wanda told her about the plan in advance, or because she Predicted it herself. Sizemore normally refers to Wanda as "Lady Firebaugh", and seems to respect her. He does not like having to defend her actions to the casters of the Magic Kingdom. As a caster, Wanda is probably aware of Sizemore's "Rock Star" status in the Magic Kingdom. She is at least superficially respectful toward Sizemore, but can be inconsiderate and curt, as she was when Sizemore suggested that Jillian could break Wanda's Suggestion Spell. They have a functional working relationship but do not appear to be social. In particular, Sizemore's willingness to study fields of magic he has no ability at puzzles the multitalented but specialized Wanda. Wanda may have gained a greater appreciation of Sizemore as a result of linking with him to uncroak the Volcano. If Wanda believes that Fate requires that other members of her side attune to the other Arkentools, she may see Sizemore as a likely candidate for this role. Jack and Wanda have known each other longer than most other units within Gobwin Knob. Both Wanda and Jack come from the Kingdom of Faq and turned to Stanley's side when he destroyed their native kingdom. While in Faq Jack and Wanda used to spend time together discussing the philosophy of magic. One philosophical question that fascinates both Jack and Wanda is the nature of Love. Is Love a form of Natural Magic, perhaps a form of Natural Thinkamancy or Natural Hippiemancy? Jack believes that Love is a force which is far more powerful and mysterious than any form of magic. As he once told Wanda, "I suspect, love is something greater than magic itself, perhaps something even the Titans are helpless before." Wanda and Jack's interest in this question was probably related to the fact that they were both deeply attracted to Jillian. Jack doesn't seem to have been angry or bitter that Jillian favored Wanda over him. Wanda made a point while in Faq of using Jack's full name and title, suggesting that she wished to maintain a certain degree of formality in her dealings with him. Jack has implied that he may be aware of some of the details of Wanda's role in the fall of Faq, specifically what went on at the battle for the capital when the King was croaked. Jack currently thinks that Wanda is a "vessel cracked worse (and repaired worse) than he," referring to Wanda's emotional and mental state, and may resent the fact that Wanda suggested allowing him to croak so that she could decrypt him. However, any concern he may have about her growing power didn't stop him from having some fun at Wanda's expense by pointing out that Jillian may now prefer Ansom over both Wanda and himself. After Jack croaks, Wanda takes an unusually strong interest in decrypting him that seems to go beyond her usual enthusiasm for her discipline. Her interest in decrypting him stems from a contract they made with Charlie long ago, which forbade them from telling anyone Charlie's secrets, but has been broken with Jack's death. While standing over his corpse, she speaks of a game they have long played at, and wonders what they will play at next. Unlike most of the Decrypted, who call Wanda "Mistress", Jack calls her "Sister", implying that in spite of his new state, their relationship is one of equal status. Wanda and Jillian have an odd, complex relationship. Fate caused Jillian to pop to help Wanda move on to the "next phase of her journey" and Wanda believes their two Fates are linked. Jillian met Wanda when she was captured by Haffaton. At the time, Wanda was addicted to Heroine buds and required by Olive Branch to torture prisoners like Jillian in order to turn them. Wanda eventually helped Jillian to defeat Olive Branch, after gaining permission from Warlady Judy to change sides and join Faq. Jillian then saved Wanda's life, by making a deal with Charlie, who helped cure Wanda of most of the physical effects of her addiction to Heroine buds. It is implied in Book 2 – Text Updates 010 that before the fall of FAQ Jillian and Wanda were romantically involved. They appear to still have had a romantic and very intimate relationship during the times when Jillian was captured by Gobwin Knob, but it's unclear how much of that is genuine, how much was the spell of control Wanda cast on Jillian, and whether there might be other factors involved. This relationship is implied to have originated from Faq during a flashback. It is unlikely Jillian knows that Wanda was unintentionally responsible for the destruction of her side. When Jillian breaks free from Wanda's Suggestion Spell, Wanda absorbs the full damage from the spell's abrupt termination. It's possible that she absorbed this damage deliberately, in order to avoid harming Jillian. She asked Parson not to croak Jillian, immediately after the spell broke. Jillian for her part remained concerned for Wanda even after breaking free of Wanda's spell. Jillian has repeatedly attempted to persuade Wanda to leave Stanley's side, once while being held captive at Gobwin Knob, again during a fly-by visit to Gobwin Knob before the Coalition attack, and yet again when they parleyed at Spacerock. Her attempts to influence Wanda was hindered by the fact that she didn't know certain critical facts about Wanda. Jillian did not know about Wanda's role in the First Battle of Faq or the prediction that Wanda would someday gain an Arkentool. Wanda did mention the Summon Perfect Warlord Spell in passing after she interrogated Jillian at Gobwin Knob, but Jillian still doesn't know many critical facts about Wanda's relationship with Parson. While Wanda benefited during the Battle for Gobwin Knob from having secrets that Jillian didn't know, Jillian has secrets unknown to Wanda. Wanda probably did not know that Jillian had rebuilt Faq and become a Queen, until she decrypted Ossomer. She still doesn't know that Jillian's Royal Heir will pop fairly soon, or that Jillian has formed separate alliances with the Royal Crown Coalition, the Western Giants, and Charlie. The two met up again at Battle of the Expository Bridge. Wanda believed that Jillian had come all this way for her, but Parson suggested that it might have been for Ansom. Reacting jealously, Wanda had Ansom sent off with the ground troops to prevent Jillian from seeing him. Wanda proceeded to parley with Jillian. Jillian indicated that she was fond of Wanda, but opposed her side because she can't stand Stanley. Jillian offered to let Wanda join her and conquer the world together. Wanda initially rejected this offer, saying that she is loyal to Fate. The Arkentools are Fated to be brought together, and she needs to stay by Stanley's side to help this event occur. Jillian suggested that Wanda could still fulfill her Fate if she joined Jillian's side, but was under non-disclosure, preventing her from sharing details. Wanda indicated that she might take her up on this offer, if she could win back her trust by helping her defeat Spacerock. Jillian pretended to agree, but proceeded to force an end to Gobwin Knob's turn, placing Wanda in a dire situation. Though unwilling to croak Wanda herself, Jillian took a great deal of satisfaction in leaving her to her apparent doom. Much to Wanda's shock, Jillian left Wanda to croak while stating that she was finally sure who she had come for: Ansom. Wanda has since entered a strong state of cognitive dissonance. She is not quite able to acknowledge what has happened in her relationship with Jillian and reacts violently to Jack's pointed hints, but realizes that somewhere, she has made a mistake. A few turns later, Parson cautiously asked her if she would be willing to arrange Jillian's assassination. After a moment of shock, Wanda enthusiastically agreed. She continued looking for ways to rationalize how Jillian could still love her and sought to decrypt her. However, Jillian's words eventually made it clear beyond a doubt that Ansom was the one she loves, causing Wanda to break down in tears. Wanda generally believes Stanley to be a fool, but does believe that he has an important fate. She was subservient and loyal to him - In fact, Wanda was probably the creature Stanley trusted and respected most in the whole Erfworld - but secretly continued to play events to bring her closer to the Pliers. She has used nookie to manipulate Stanley. This might explain her revealing outfits. Since Wanda's attunement to the Arkenpliers she seems to be happy to go along with Stanley's orders as long as she can play with her Pliers and her personal army. Stanley feels somewhat insecure about this new balance of power. Wanda's attunement to the Arkenpliers poses a very serious threat to Charlie's existence. As long as War is simply a matter of different sides competing for economic resources, then most Royals will not hesitate to hire a non-royal Mercenary like Charlie, if it seems profitable to do so. But by allowing Ansom to spread the idea that there is an inherent ideological conflict between Royals and Units attuned to the Arkentools, Wanda damaged Charlie's ability to persuade Royals to hire him. Charlie's primary objective at the Assault on Jetstone was to have Wanda croaked, in order to discredit Toolism. Jillian informed Charlie that Wanda does not hate him and would probably even be willing to work for him. Later, under the bedrock, Charlie did confront Wanda with the proposition to join Charlescomm. Wanda's terms for that were too harsh, though, like being equal co-owners of the side and controlling half of the Archon population as Decrypted. Wanda has always respected Parson's tactical mind. Wanda sees Parson as another agent of Fate, and believes she knows his future well enough to be able to predict that he will suffer and take losses in future battles. The two have a good working relationship, but Parson fears her and considers her a monster. Wanda has willingly shared some of her secrets with Parson. She does not seem concerned that he might ever use any of them against her. It appears that after the Battle for Gobwin Knob, Wanda's respect for Parson's tactical mind has increased even more, and Ansom believes that she clears each strategy with him before acting. However, in one case, she has chosen not to follow his advice. Parson has come to lose a great deal of faith in her over her grievous errors involving Jillian. Before Anson's death, the two were violently antagonistic. Because of his hatred for Stanley, Ansom naturally hated and despised Stanley's closest followers, including Wanda. Wanda was not only slaughtering Jetstone troops whom he badly wanted to defend, she was also defacing Jetstone's corpses, and using them to croak even more of his followers. Wanda considered Ansom to have stolen something from her that was of even greater value than the Jetstone troops she'd croaked. She may have been referring to the Arkenpliers or to Jillian or to both. After Ansom's decryption, Ansom feels a deep love for Wanda, and hopes to gain her love in return. He resents the fact that Wanda frequently seeks Parson's advice, in part because he wants to show Wanda that she doesn't need any Warlord except him. Wanda took great pride in her ability to decrypt Ansom, and currently regards him as a very useful and loyal servant. She understands that both Parson and Ansom are talented Warlords, and tries to make the best use she can of both of their respective talents. In the final analysis, though, she feels she can make her own decisions, and so doesn't completely rely on either Parson or Ansom. After finally being forced to accept that Jillian loves Ansom more than her, Wanda and Ansom's relationship has become tense. Wanda does not know her ultimate Fate, though she believes she must gather together all of the Arkentools. But if the Titans believe that their creation has outlived its usefulness, then it may be Wanda's Fate to perform the ultimate act of Naughtymancy by destroying Erfworld. Given that all of the Arkentools were used to create Erfworld, it may be that all of them are needed to destroy it as well. Given the enormous magnitude of the debt to Fate that Wanda acquired when she popped, it is possible that only the complete destruction of Erfworld will be sufficient to fully repay her debt. It may be that Marie understands Wanda's Fate, but believes, as a Predictamancer, that it is not her place to try and stop the Titan's will. It may be that Marie arranged for the Ultimate Warlord to come to Erfworld so that he might unknowingly insure that Wanda achieved her Fate. If this is the case, then she has misled Janis by persuading her that summoning Parson will result in the end of War on Erfworld. Of course, the end of Erfworld would also mean the end of war on Erfworld, so perhaps she has not technically lied to Janis. Given Wanda's obsession with Fate and her talent for picking up diverse casting disciplines, it may be noteworthy that she has never been seen attempting to learn or cast Predictamancy of her own. Wanda informed Parson after the Battle of Gobwin Knob that her real loyalty is not to Stanley, but to Fate. The question is, what does she believe it is her fate to do? Wanda knew that she was fated to one day attune to an Arkentool, but did not know which Tool it would be, or exactly how this would be accomplished. This suggests she has not been in direct contact with Marie Lavraie. However, now that at least part of her Prediction has been achieved, she may try to seek out further contact with her. Her willingness to continue working with Stanley, even though she now has an Arkentool of her own, suggests her future goals require at least two Arkentools. It's possible that she will try to acquire other Arkentools for other members of her side, such as Sizemore, Jack, or Maggie. SomeTemplate:Cite believe that Wanda looks eerily similar to Ashna. Firebaugh is a real-world name, and also the name of a town in California. "Wanda Firebaugh", however, is a pun on "wand of fireball", a fairly common magic item in "Dungeons & Dragons" and other fantasy games. Depending on pronunciation, her last name also becomes "firebug", a slang term meaning someone who relishes causing destruction, especially through the usage of fire. A very prophetic last name indeed, given the pivotal role she plays in the Volcano Uncroaking. Wanda's strong predilection for dominance and seduction in her torture techniques may be a reference to the widow Wanda von Dunajew in the novel Venus in Furs. Croatan tribe that Wanda hails from really existed and is really lost. It was pointed out that a company named Zhejiang Wanda Tools Co. Ltd specializes in making pliers. Her name has been used as a reference to the film, A Fish Called Wanda; however, there are no obvious parallels between the movie (the fish Wanda or the character Wanda Gershwitz) and Wanda Firebaugh. Some have speculated that the death of the fish called Wanda at the hands of Jillian Zamussels may be foreshadowing a similar fate for Wanda.